NYC Recession Diary: Foursquare: Check their NEW brand page for deals! Foursquare: Check their NEW brand page for deals! This is especially exciting for all you social media masters/mavens: Foursquare has added a tool to the app that will ultimately help users find even more pretty sweet deals. For those of you who aren't aware of the wonders of the 'square, Foursquare is an app that lets you "check-in" to a location, as well as see where your friends have checked in. 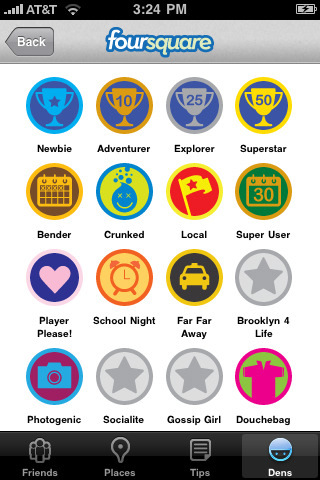 You can add details and tips to that location and the more you use the app, you get to earn "badges". The more you visit a location, the more points you earn. Points can end up in special discounts and deals, just for Foursquare users. However even without frequenting a location a lot, Foursquare users get exclusive deals all the time. NYCRD reported a little while back a deal for free lipstick from NARS as well as a series of other specials. Now that you've had a Foursquare tutorial, here comes the real news. Foursquare just added their Pages Gallery. This page lists hundreds of brands that are on Foursquare and allows you to Follow the brand and earn tips and even badges. Some of the brands listed are Bravo, MTV, Starbucks, Walgreens, and so many more. You can search for brands as well as check out what your friends are following. Another great tool to an already amazing one. Kudos to you, Foursquare, kudos to you.